The Famous author, creator and billet worker, Al Mann said, "You rattled me with your Jagged Edge billet test. It is great and original. I only wish I had it when I wrote The Purloined Thought." Docc Hilford has taken the simplistic course of the Center Tear and given it a new direction. 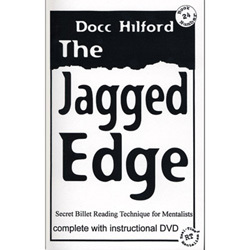 The Jagged Edge allows the Mentalist to know EVERYTHING that is written on a list. Ten people are asked to think of a past president. Each person must think of a different president. To facilitate this, a small pad of paper passed among the participants. Checking to make certain that their chosen president has not been listed, each person writes the name that they have in mind. If the name is already on the list, the participant has to select a different name. When all ten people have chosen a name, a new person looks over the list and circles one name. The written list is no longer needed so one of the spectators removes the sheet and folds it into quarters. The pad is tossed aside. The mentalist tears the folded paper and throws it away; after all, it was needed only to make certain that no names were duplicated. THE MENTALIST IS NOW ABLE TO LOOK AT EACH PERSON ON THE LIST AND REVEAL WHAT NAME THEY HAVE IN MIND! Beyond this remarkable demonstration, the mentalist asks a member of the audience to open a large envelope they have been holding since before the list was made. Inside is a prediction. It reveals that the mentalist knew the name that would be selected by the participant that circled a name! This new billet technique is applicable to endless presentations. In an instant, you will be able to know what was written on the list, who wrote what and which of the list was selected. If you ever wanted to be able to entertain a large group of people with nothing more that a BORROWED piece of paper, now you can. Only one paper is used. No carbons in the pad, or anywhere else. Perfectly logical reason for writing the thoughts. Can be used in an endless number of tricks. Can be learned in a few minutes. Can be used with a spirit medium act. And which thought was selected.